I’ve mentioned this to a number of people over the years, but I’m just now getting around to actually writing it up. Don’t call me crazy, but yes, I make my own laundry soap. I’ve always had a great sensitivity to soaps, detergents, and smells. Remember when we were kids and just walking into a department store necessitated the Running of the Perfume Gauntlet? I HATED going shopping because it meant that I was left gasping for air and itching like crazy the rest of the day from all the crap the fancy dressed ladies behind the counter would spray at you as you passed. Gag. I don’t think I detested anyone as much as those blasted perfume people, but being sensitive to such things is actually a really big pain. It means that when I travel, the little soaps leave my hands rough and chapped. When I go out with friends, riding in the car with their perfume makes my eyes water. Switching detergents turns me into a dry skin itch factory. Because of this, for YEARS, I’ve used the same soap, the same dish detergent, the same shampoo, the same laundry soap…switching just really isn’t much of an option long term. This meant that for a very long time, I used Tide Free. A few years back, Tide Free got expensive. Really expensive. We have three kids and the huge change in price sucked and though it doesn’t seem like a big deal, when you have a very slim budget (yay medical bills!) a dramatic price change in something small really has a greater effect than you might think. We just happened to have some dear friends, Jen and Karl, visiting that summer and I mentioned in passing that I really hated doing the laundry because it was just so expensive and Jen laughed and said “You should just make it yourself! It’s so cheap and does a better job!” So, with her prodding and with a bit of hesitation on my part, I decided to give it a go…if it made me itch, I would just use it on everyone else’s clothes and do mine separately for a while if I needed to. Well, it was AMAZING. The clothes are clean, the stains come out, everything is fresh and wonderful and I don’t itch. It’s also ridiculously easy and cheap. Using a food processor, shred, then chop the Fels-Naptha bar into tiny bits. I usually chop in some of the washing soda with the bar to blend it better. Mix all ingredients together and store in a container. I use my old Tide Free box. Use 1 TBSP for a full load of laundry. If you have something particularly dirty or smelly (like the time you forgot the laundry and it sat in the washer for two days) pour in a cup of white vinegar when you start the load and it will fix that right up. That’s it. It really can’t be more simple. Before, each load of laundry was costing about $0.25 or more PER LOAD. Mine is now $0.06 or less! 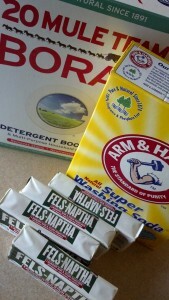 The borax is about $8, the A&H Super Washing Soda about $5 and the Fels-Naptha is $1.25 per bar at the store. Not counting any sales or coupons or anything, I can make 7 batches of the above recipe for $22 (1 box Borax, 1 box A&H, 7 Fels-Naptha bars) and I’ll have made enough detergent for 336 loads of laundry and still have Borax left over. Now, I won’t say that I think laundry is all sunshine, rainbows and unicorns, but now at least it doesn’t bother my budget.